In Siddhartha, we follow a spiritual seeker through his wandering, Enlightenment, and finally, through his entrance back into the world. The seeker, Siddhartha, is placed in the time of The Buddha and actually meets The Master himself, hearing his teachings first hand. Surprisingly, Siddhartha chooses not to become a disciple of The Buddha, but instead attempts to attain the Ultimate Goal on his own. Siddhartha finds what he seeks and then returns to civilian life, living among ordinary people as an "enlightened one." Throughout, the reader finds themselves immersed in the world of Hindu and Buddhist thought. Overview: The book is divided into two sections. In Part One, Siddhartha seeks and attains Enlightenment, and in Part Two, he re-enters the world. "Within himself Siddhartha had begun to nourish discontent. He had begun to feel that the love of his father and the love of his mother and even the love of his friend Govinda would not forever after delight him, soothe him, satisfy and suffice him. He had begun to surmise that his venerable father and his other teachers, that these wise Brahmins had already conveyed the majority and the best part of their wisdom, that they had already poured out their plenty into his waiting vessel, and the vessel was not full, the mind was not satisfied, the soul was not calm, the heart was not stilled. Ablutions were good, but they were water, they did not wash away sin, they did not quench spiritual thirst, they did not dissolve fear in the heart. Sacrificing to the gods and invoking them was excellent – but was this all? Did sacrifices bring happiness? And what was the nature of the gods? Was it really Prajapati who had created the world? Was it not the Atman, He, the Sole One, the All-One? Were not the gods representations, created as you and I, subject to time, transitory? Was it therefore good, was it right, was it a meaningful and supreme act to sacrifice to the gods? To whom else was one to sacrifice, whom else was one to venerate, besides Him, the Only One, the Atman? And where was Atman to be found, where did He abide, where did His eternal heart beat, where else but within one's own I, deep inside, in what is indestructible, borne within every individual?" With a spiritual desire that can't be quenched by the things of the world, or even his traditional religion, Siddhartha, again echoing the life of The Buddha, leaves his security behind to become an ascetic religious seeker – a shramana. As Siddhartha develops as a shramana, mortifying his passions and harshly disciplining his body, he eventually finds his way to The Buddha himself and encounters his teachings. Although Siddhartha finds little wrong with The Buddha's teachings, he realizes that the teachings themselves are not what he is looking for. No body of teachings can ever encompass what the Buddha experienced – Enlightenment. "To no one, o most Venerable One, will you be able to speak and convey in words what happened in the hour of your enlightenment! The teachings of the enlightened Buddha encompass a great deal, they teach much, how to live righteously, how to avoid evil. But one thing the teachings, so clear and so venerable, do not contain: they do not contain the secret of what the Exalted One himself experienced, he alone among the hundreds of thousands." Siddhartha thus leaves The Buddha and his community to seek Enlightenment on his own. The Enlightenment eventually comes, seemingly from nowhere, and the experience is described in a manner similar to Satori. "'He always seems only to play at business, it never gets into his blood, it never rules him, he never fears failure, losses never bother him'...If he had profits, he pocketed them with equanimity; if he met with loss, he laughed and said: 'Oh, my goodness, this has gone very badly!'" "Belongings, assets, and wealth in the end had captured him, this was no longer play, these were no longer frills, rather they had become a burden, and he was chained to them." Siddhartha has re-entered Samsara, and is unable to keep himself from being overtaken by it. The remainder of the book narrates Siddhartha's continued relationship with Kamala, his reunion with Govinda (his friend as a youth), and his ongoing spiritual struggle. "Blue was blue, river was river, and if the one and the divine also lay concealed in the blue and in the river and in Siddhartha, it was just the nature and meaning of the divine to be yellow here, blue here, there sky, there forest and here Siddhartha. Meaning and essence were not somewhere behind things, they were inside things, in everything." Part Two, in which Siddartha re-enters the world, eventually becoming engrossed in what he had once left behind, was kind of confusing to me. When he initially comes back, I thought it was a good picture of how one who has become "unattached" can then live a regular life, but from a different view – engaging in the things of the world, but remaining inwardly detached from them. But Siddhartha seems to alter between states of "re-finding" his enlightenment, and then losing it again, and I am unsure how to interpret the ending of the book. 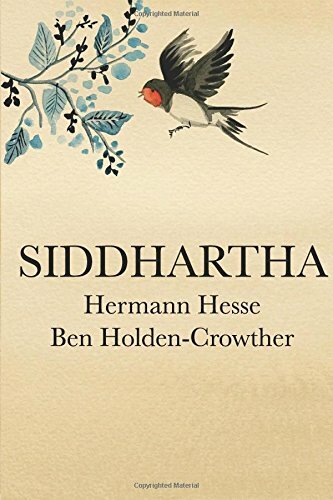 Overall, I think the main value of Siddhartha is gaining an understanding of some of the major themes of Hinduism and Buddhism in narrative form. It's a short, engrossing read, but one you'll want to take your time with.